Two last cards from the Dark. The Dark had fewer bad, difficult or interesting wordings than I thought it would. This owes, presumably, to it being one of Magic's smallest sets. Still, I found 50% more cards in Homelands than in the Dark in my first-glance reading. Maybe the dark isn't quite as strange as I thought. Maybe it's just a coincidence that the rules have evolved in a way that make a card like Dance of Many easy to word and understand. Very badly costed artifacts were everywhere in the old days of magic. Basically reflecting mirror requires you to sit with all your mana untapped while you opponent plays spells that don't target you, then when you finally have to react they get to target you. But even bad cards need good Oracle wordings. , Tap: Change the target of target spell with a single target if that target is you. The new target must be a player. X is twice the converted mana cost of that spell. Second, the original wording does not specify the spell has to have a single target, it only says the spell has to target you. I understand the desire to put this in: if you leave it out, the mirror doesn't work at all the way most people would assume. 114.6a If an effect allows a player to “change the target(s)” of a spell or ability, each target can be changed only to another legal target. If a target can’t be changed to another legal target, the original target is unchanged, even if the original target is itself illegal by then. If all the targets aren’t changed to other legal targets, none of them are changed. to gain 4 life and make you sacrifice an attacking creature? Well, if it were a multiplayer game, you could change the target opponent to another opponent of the caster, and also change the target of the life gain to you, since reflecting mirror allows you to assign new targets to be players. Suddenly you are playing with Attracting Mirror. to make you discard a card and take 2 damage? It has two targets so you can't reflect it, even though both targets are you. 114.8a An object that looks for a “[spell or ability] with a single target” checks the number of times any objects, players, or zones became the target of that spell or ability when it was put on the stack, not the number of its targets that are currently legal. If the same object, player, or zone became a target more than once, each of those instances is counted separately. I know why the single target wording is there in the Oracle text. I was around when the mirror was printed, and what it meant to change the target of a spell was not as clearly defined then as it is today. They had to make ruling to try to make sense of weird situations. The simplest thing was to say that Reflecting Mirror didn't work unless the spell had only a single target. , two sets later, you'll see that it even specifies that the new target must be legal since that wasn't implicit. But I regard this as an "we don't know what else to say" ruling, not a as a real errata. I'd prefer the Oracle wording of Reflecting Mirror go back to the original wording, and possibly the original intent. Back in The Dark we were still in the days when most Magic players were playing based on flavour judgments rather any actual rules, so what do we expect the mirror to do? I think with the imprecision of the original wording we have two options. One is restricting it to spells that only target you - which is very different than spells that only have a single target, if that target is you. The other is allowing it to change only targets that are you. X, Tap: Change the target of target spell that targets only you. The new target must be a player. X is twice the converted mana cost of that spell. X, Tap: For each time target spell that targets you targets you, change that target of that spell. The new target must be a player. X is twice the converted mana cost of the spell. Both have the problem of allowing you to use Reflecting Mirror to split a spell with multiple player targets to two different players. and it's not Reflecting Beam Splitter. 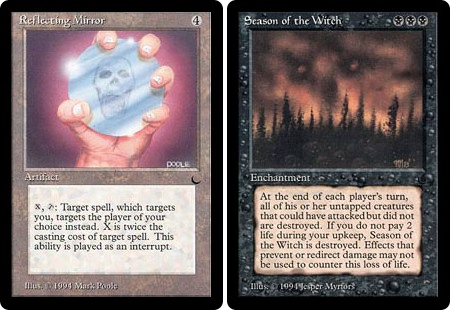 I like the former a little better, the idea being that the mirror should reflect the entire spell, but it might not reflect the entire spell anyway, so I'm happy to go with the latter to make it more compatible with a fix to make sure you reflect the spell in just one direction. X, Tap: Choose another player. For each time target spell that targets you targets you, change that target to the chosen player. X is twice the converted mana cost of the spell. I'd definitely want to workshop this with other Oracle experts, though. This is the first time I've acknowledged in an Oracle Review that I might not simply know best about everything. It will also be the last. At the beginning of every end step, regardless of whose turn it is, the second ability triggers. When it resolves every creature that could have been declared as an attacker during that turn’s Declare Attackers Step but wasn’t will be destroyed. A creature won’t be destroyed if it was unable to attack that turn, even if you had a way to enable it to attack. For example, a creature that had summoning sickness wouldn’t be destroyed even if you had a way to give it haste. So what does it mean to say a creature could have attacked? It means it could have been declared as an attacker during that turn's Declare Attackers Step. You know that that means.